Several years ago at Quilt Market I noticed that fabric manufacturers were bundling their fabric collections. Oodles of coordinating fabrics neatly tied together in an oh-so-lovely set. They were so beautiful, and I was totally drawn to these colorful stacks of fabric. And a new term emerged: Pre-Cuts. So what are pre-cuts? If you are relatively new to the world of quilting, then you are in for a treat. Fabric manufacturers are putting together pre-cut collections showcasing all of the fabrics from a collection. In doing this, fabric manufacturers have simplified the entire fabric purchasing process and made it easier for all of us to do what we really love, which is sewing. 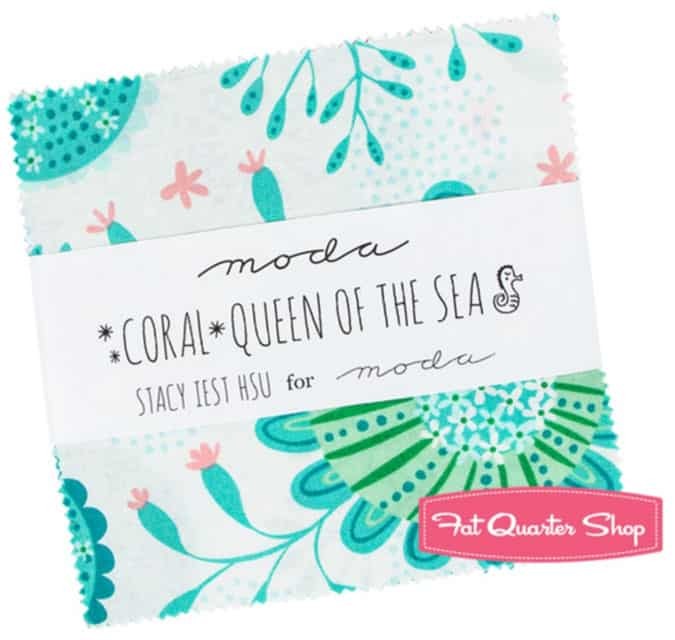 Many of the bundle names are specific to Moda fabrics with names such as Jelly Rolls, Layer Cakes, Charm Packs, and Jolly Bars. These terms have now become commonplace in the quilting world which is why I will be using them. One of the biggest benefits of pre-cuts is how little space they require. Jelly Rolls, Charm Packs, Jolly Bars,and Layer Cakes can all fit neatly into a drawer. There is very little fabric wasted when using pre-cuts. Many patterns are now designed to use most of a pre-cut set, leaving you very few scraps to store. When you buy a pre-cut bundle you’re able to sample from the entire collection. That’s not always the case when you purchase yardage at a quilt shop or online. Many times sellers do not purchase every fabric in a particular line. The fabrics all match. Everything is color coordinated and blends beautifully with the entire collection. You save a ton of time by not cutting fabric – leaving you more time to sew. I think the biggest question I hear is, “How do I use pre-cuts?” To help you out with this, I’ve broken down several of the most popular pre-cut sets and listed a few ideas for how to use them. A fat quarter bundle is the most common of all pre-cuts. Each piece of fabric is 18″ x 22″. It’s size is ideal for cutting out a variety of quilt pieces due to its square shape. Each fat quarter can be cut down into lots of different piecing shapes: 10″x 10″ squares, 5″x5″ squares, 2.5″ strips, and 2.5″ squares. These shapes can then be turned into simple shapes such as half square triangles to give variety to a quilt. 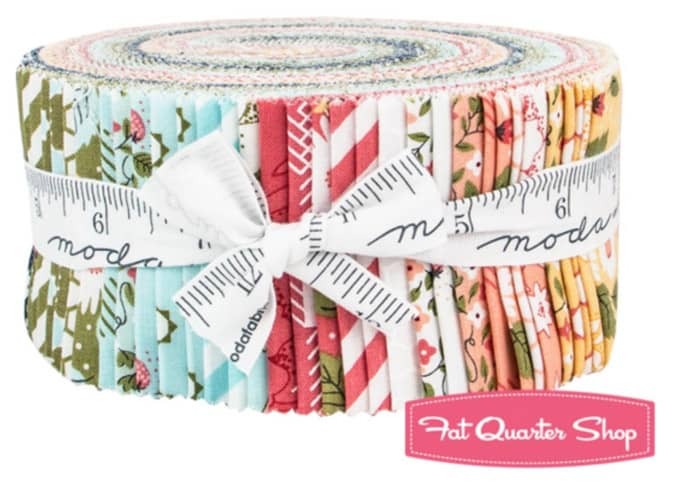 A fat quarter bundle can be made into a variety of projects. 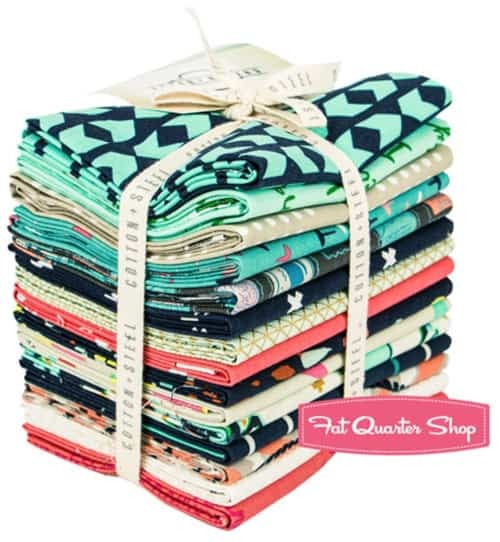 Many fat quarter bundles will have at least one piece of fabric from the entire collection. A fat eighth bundle is very similar to a fat quarter bundle only half as wide. Similar to a fat quarter, fat eights are 9″ x 22″. Ideal for cutting smaller shapes such as 5″ squares and 2.5″ squares. Not as versatile as the Fat Quarter Bundles, but still allows for cutting a ton of different quilt shapes such as half square triangles and smaller strips. Many fat eighth bundles will have at least one piece of fabric from the entire collection. Most Jelly Rolls contain 42 strips of 2.5″ x 42″ (WOF) fabric. Sometimes called Rolie Polies or Roll Ups. Ideal for borders, binding, and sashing. Tons of simple projects can be made from one jelly roll: Table Runners, Baby Quilts, Placemats, Bags,and Rug Mugs. Ideal for new quilters because it doesn’t require additional cutting supplies. Economical because there is very little waste. A Layer Cake is a collection of 10″x 10″ squares that usually contain one of each print in a collection. Sometimes called Patty Cakes or 10″ Stackers. They are great for putting together a a large quilt quickly. Just arrange the squares and sew together and you’re ready to quilt. Layer Cakes are an ideal size for small pillows. They are a good size for making bags. Perfect for a making smaller quilts. Can be cut into smaller 5″ and 2.5″ squares. A Charm Pack is a collection of 5″ x 5″ squares that usually contains one of each print in a collection. Sometimes called Bali Packs and 5″ Stackers. This is a perfect size for making a 9-Patch quilt. Charm Packs are perfect for beginner projects. You can open and begin sewing right away. They are ideal for simple projects like a baby quilts, sachets, and bags. Perfect for making hexagons for EPP (English Paper Piecing). A Mini Charm Pack is a collection of 2.5″ x 2.5″ squares that usually contains one of each print in a collection. They are great for small projects like the Simple Quilted Zipper Bag. Inexpensive way to reference an entire fabric collection. Perfect for simple, small projects. Easily to store and doesn’t take up much space. There are a few other pre-cut collections that you can choose from, but these six are the most common ones available. 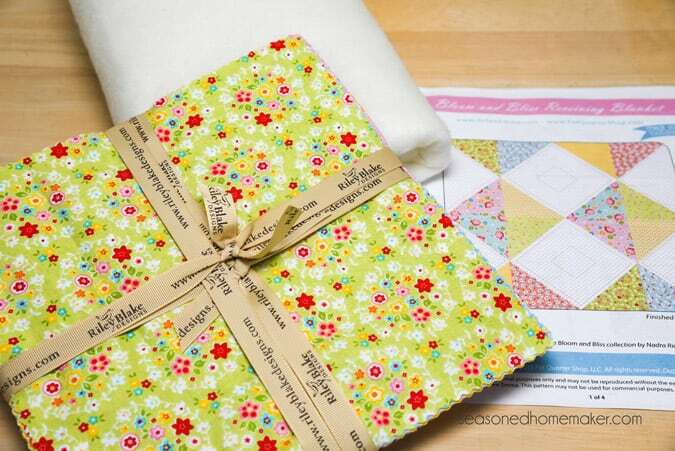 Almost every fabric collection will now come with one or all of these pre-cut sets. A special thanks to Fat Quarter shop for allowing me to use their images and also graciously giving away three pre-cut sets! I am a total beginner, so didn’t know beyond fat quarter. Thanks for this! I think the pure cuts are just the greatest.they take the guess work out of choosing coordinating fabrics and that’s a time saver for me. I’ve always loved precuts as they can save so much cutting!! My next project will be a year end teacher quilt. I love precuts!! Baby blankets galore ? I love the precuts – it makes things much easier!! I’m a huge fan of the pre-cuts. They eliminate the search of coordinating fabric and their cut already so that saves a step as well. Big fan of Fat Quarter Shop’s Jolly are too! 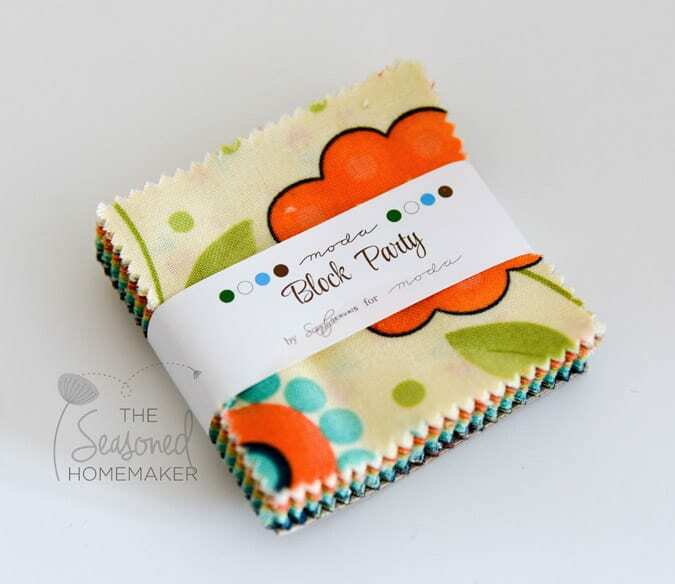 Super fabric – I would make some table toppers for my patio furniture. They would look great with big pretty lanterns and candles in the summer evenings! Love pre-cuts! Thanks for the great info! I would love to win one of these beautiful sets! I’d make an origami bento bag. I love how precuts let us quilters nab a sampling of a whole new line. I even love the mini charms! I think I would use these in a baby quilt. I’ve wanted to try some of these packs. Thank you for making it possible! I have not used pre cuts but after reading your explanation of the best ways to use them I may give them a try.. I would make a summer picnic quilt to take on my grandchildren’s adventure outings. Quilts are part of memory making and can become many things – a blanket, a tablecloth, a temporary hidingp place – all on the same day, and the Summerfest Collection is so cheery and bright, perfect for indoor or outdoor activities. I think I’d like to make a lap quilt for the living room. This is such a bright, cheery collection. Love the precuts. I would make a baby quilt with mine! I adore precut they make it easy forme to get something done quickly. When I buy yardage I turn my scraps into precuts. I would love to make (my first) baby quilt, as a gift to my two favorite teachers, who just learned that they are expecting a baby girl! I would make a quilt of course. Nice article. I have limited sewing time with my full time job, but would give the Jolly Bar pack to my 80 year old Mom, who has made a beautiful, hand- quilted, quilt for each of her 8 grandchildren when they graduated from high school and is now producing charming baby quilts for her great-grandchildren (6 and more on the way!) as they arrive, in between the pot holders, table runners, Christmas tree skirts, wall hangings and other projects she produces for her insatiable family and her quilting group which raises funds for a local historical society. So many possibilities with such gorgeous pieces of fabric. It’s choosing which fabrics at the quilt shop to put together that I find challenging. This way is a win win – gorgeous fabrics guaranteed to co-ordinate. Thanks for explaining the different pre-cuts. Thank you for the wonderful article! It really did shed light on the mysteries of pre-cuts! The pictures here are gorgeous! Did you take them yourself? And if so, what camera did you use? Thank you! 🙂 Your article is really nice! Most photos are from Fat Quarter Shop (used with permission). I took the one with the Layer Cake fabrics using my Nikon D750. Just moved and would love to make decorative, fun pillows for my new patio set on my screened porch! Thank you for the info! I would love to make a small quilt with this fabric. I love precuts! Hadn’t heard of the Jolly Bars so will have to watch for them. These fabrics will make a cute table runner oe baby blanket. What fun summery fabrics!!!! I would love to get my hands on these! I think they would make lovely lap quilts for the grandparents. That’s what they would probably end up being turned into here. I love precuts. I plan on making some quilts with them this year. 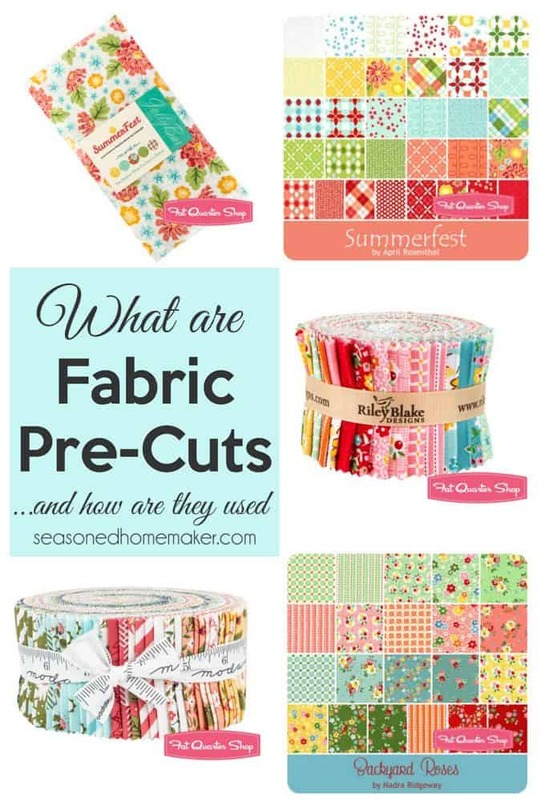 I have come to love precuts because they give me a great variety of fabrics! I’ve done a couple of mosaic quilts, and precuts are great for those! I’ll make a quilt (my first!) for my new granddaughter!! Leslie, I don’t have a clue what I’d make with this fabric. I always buy fabric I love and then after looking at it in my stash for awhile the ideas start coming to me and then I decide. But I do love this fabric and I know it has a lot of possibilities! Thanks for the giveaway! The Jolly Bars are the only precuts I haven’t used yet, but I love the quilts that the designers come up with while using them! Thanks for your sewing/quilting blog, I’m always learning something new! Wonderful blog and fun giveaway! 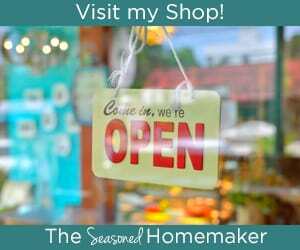 Your ideas are very helpful, sewing, cooking and gardening! You are always thinking of others as you create. I love all these pre-cuts. Seem to be buying these over yardage lately. You get the whole lime of fabric and it’s all coordinating. i love precuts and this fabric is perfect for a quilt for my new grand child due in dec.
Love this! I would make a baby quilt and some bags! I am a beginner quilter. I would use the Jolly Bar to make a baby quilt for my grandbaby coming in October. Thank you for explaining the sizes and uses of precuts. I have been curious but did not know where to start. This would be perfect to make a quilt for my 7 yo daughter! I am relatively new to your blog. I have really enjoyed your content. Thanks so much for the breakdown on pre-cuts. 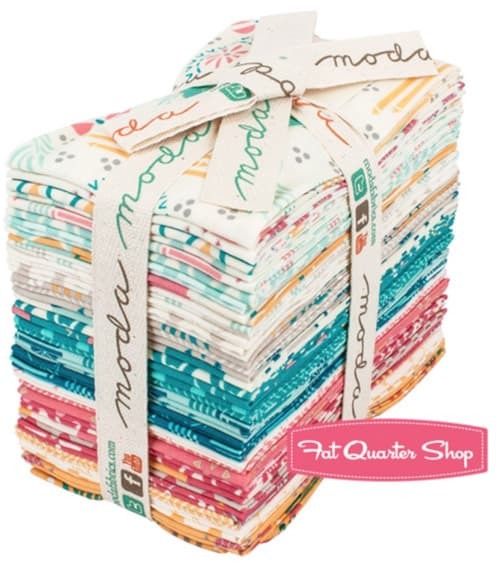 I discovered the Fat Quarter Shop through your blog and have ordered a few pre-cuts through them that I love! I am a wanna-be quilter. This giveaway is just what I need to get started. Thanks. Summerfest colors are bright, happy and perfect for a summer quilt for a cool nights at the beach! I have sewn for years and have always planned to make quilts, but haven’t really done anything except a wall hanging. So, I would finally do a quilt for a bed! Right now I am obsessed with learning how to use half square triangles. I never made these before and I think they’re fantastic! Somehow, someway, I’ll use these precuts in my new obsession! I’ve been lurking your blog and following your various projects. You almost have me convinced to try quilting again. Small projects appeal to me. Thanks for the encouragement. That fabric is so pretty! And thanks for the information about all the different precuts. love precuts! this line would make an adorable quilt for one of my grand girls! The precuts are great…and defy procrastination! Thank you for the ideas!! So glad that you unlocked the mystery of the beautiful fabric packets with sizes and suggestions of projects the work well with each. For those of us who are challenged with coordinating fabrics – our excuses are fleeting! I have never purchased any of these, but wow what have I been missing!!!!!!!!!! One of the best go-to posts for quilting and sewing beginners, thanks! It’s awesome you defined the dimensions of each precut bundle type – all information in one place! This works best for many of us, hobby sewists!